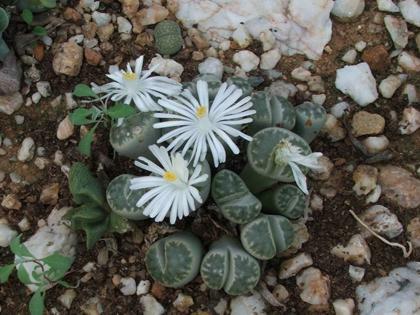 South Africa is well known for its rich diversity of dwarf succulents, especially its stone plants. This corner unit displays typical stone plants including Lithops species, Pleiospilos species, Argyroderma species and Gibbaeumspecies as well as other dwarf succulents, such as Crassula species and Conophytum subfenestratum which resembles a pebble. The display represents a transect through South Africa, from the west coast desert to the east coast of the Eastern Cape. The middle beam of the corner unit more or less divides the winter and summer rainfall flora. Rocks from the various regions were introduced as well. These include Enon Conglomerate, Beaufort- and Malmesbury shale, dolomite, surface limestone, Dwyka Tillite, Quartz, Gneiss and Malmesbury shale. As most stone plants come from the quartz gravel flats, this corner unit is based mainly on the Knersvlakte. The name comes from the grinding sound, kners in Afrikaans, of one’s footsteps on the stones as one walks over the ground. The gravel was collected from Kwaggaskop farm, belonging to Mr. Buys Wiesse. The western part of the display is for plants from the Richtersveld and adjacent territory along the Orange River such as Pachypodium namaquanum (elephant’s trunk or halfmens), Euphorbia stellispina (star-spine euphorbia), Gasteria pillansii (Pillans ox-tongue), Massonia bifolia (pagoda lily), Bulbine striata and Bowiea volubilis subsp. gariepensis (Gariep bowiea). To give the bed some height and structure many Tylecodon paniculatus (butter tree) plants have been introduced. Other larger succulents displayed here include Aloe ramosissima (dwarf quiver tree), Aloe dabenorisana (Dabenoris aloe), Tylecodon wallichii (quiver bush), Crassula arborescens (jade plant), Cotyledon adscendens (climbing cotyledon), C. eliseae, C. tomentosa subsp. 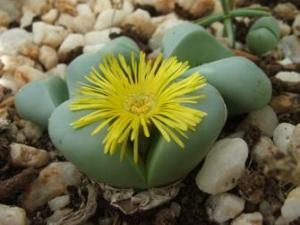 ladismithiensis (Ladismith woolly cotyledon) and Othonna cyclophylla. 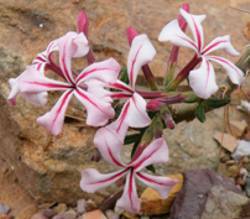 Pachypodium succulentum (porcupine kambroo) and P. bispinosum (kambroo) flower during summer with striking pink to white tubular flowers. A few bulbous plants are also displayed. These include Boophane disticha (century plant), Brunsvigia herrei, Cyrtanthus herrei, Gethyllis species (koekemakranka) and Lachenalia species. 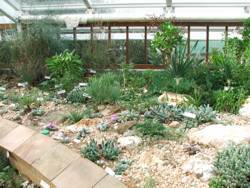 Typical plants from the Succulent Karoo on display include: Aloe erinacea (hedgehog aloe), A. variegata (partridge breast aloe), Gasteria carinata var. retusa, G. disticha, Tylecodon pygmaeus and Gasteria rawlinsonii (cliff ox-tongue). The free standing bed between the door is mainly used for displaying the rare cliff dwelling succulents, Gasteria rawlinsonii (cliff ox-tongue), Huernia pendula, Tromotriche baylissii and Aloe meyeri. Oxalis nidulans var. 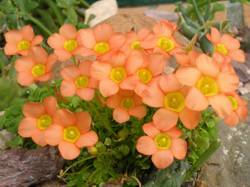 nidulans (=Oxalis schlechteri) with its striking orange and yellow flowers during spring is used here as a ground cover.